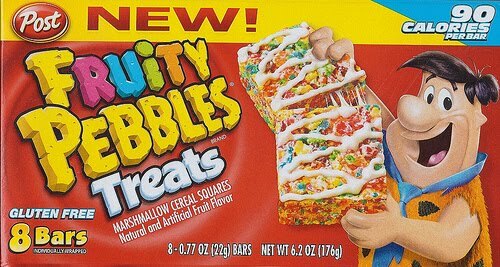 pocket full of rosey: fruity pebbles treats.. gluten free! ooh!! i was at the grocery store tonight picking up some ingredients for a recipe (which i'll share with you later) and i came across these bars. i of course had to try them, since fruity pebbles are one of my favorite cereals! these bars are fun and really pretty tasty. one of the best parts is they're packaged and great for on the go. sure, they're not exactly healthy but hey, you gotta let yourself have some "fun" foods sometimes and i'm always excited to find a new gluten free snack! i'd give them a 4 star rating..
gluten free, 90 calories and only 9 grams of sugar!